I’m not in the business of making short-term price forecasts for stocks, bonds, or anything else, including gold. Gold has had quite a run over the last decade. 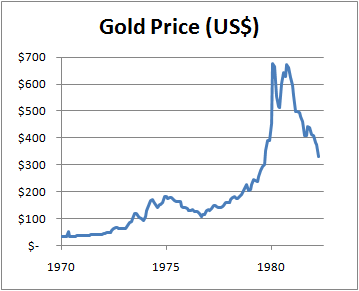 I thought it would be a good idea to take a look at a gold chart from the last time gold had a great run (1970 to 1980). The chart below shows that decade plus a couple of extra years. Now this might look like I’m predicting that gold is going to crash soon. In fact, I just want to point out that this is a possibility. This shouldn’t be a great concern for those who have a small slice of their portfolios in gold. But for those who are piling into gold with the bulk of their portfolios because of government debt fears, inflation fears, or just bullishness on gold, such a crash is one of the many future possibilities. Diversification is a good thing even when it comes to gold. Good post. Investors seem to forget past lessons over and over again. I also have no idea which way gold goes from here. And I also am fine with not holding gold directly as the mining stocks in my index funds are influenced by the price of gold anyways. Thanks for the reminder to not chase performance! very tempting and hard to avoid. It's funny that many investors are now interested in adding gold to their portfolio... purely for "diversification" reasons, you know! @Preet and @Chris: Thanks. The number of come-ons I see about buying gold is getting out of hand. @CC: As novice investors learn more about investing, it's interesting that some invest smarter and others just keep doing what they've always done but have smarter-sounding explanations for their actions.